Our new ASL Tactical / Survival / Bushcraft knives are already getting media attention. Click on the link below for a direct connection. The first two production runs are totally sold out and our third is being shipped soon. Order yours today and choose Mil Spec Hummer Desert Tan or Stealth Black. 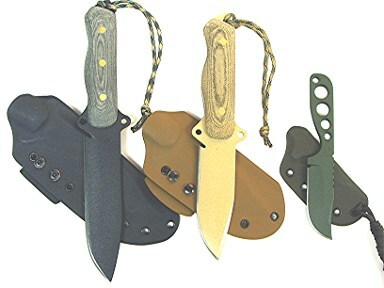 New on this order is the availability of Mil Spec Olive Drab on our WASP neck knives. 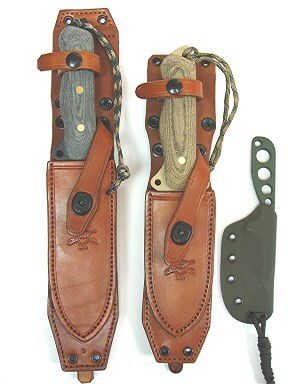 The ASL Leather ASSAULT sheaths are now in Generation II and are even more molle compatable. Although made for our ASL knives they can be custom made for your TACTICAL / SURVIVAL/ or BUSHCRAFT knife. The new shipment of ASL TACTICAL / SURVIVAL / BUSHCRAFT knives has arrived here at Chisholm’s Trail Leather. We now have Stealth Black and Hummer Desert Tan. We can do Tanker Grey and Military Olive Drab on special order. Gen II of our ASSAULT leather sheath has improved molle attachments and grommets locations. These new and improved sheaths are available for an additional cost. Please view our knife button. Our kydex SHADOW sheaths for Tactical Knives are now able to be worn in over 20 different positions from horizontal to vertical. They are available in Desert Tan, Stealth Black, and Military Olive Drab. Look closely at the blades in the photo. You can see the precisely ground edges, the quality powder coating, contoured micarta handles, glass breaker pommel, and our ASL logo stamped deeply into the steel. If you had to depend on one blade to survive could you think of any other features than each of these combat tested knives provide? Notice the WASP neck knife on the right with the stinger point. We have maximized the amount of cutting edge available so you can cut and skin with ease. You can order yours today. 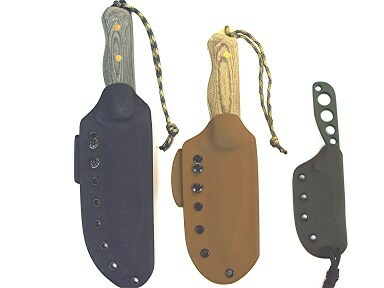 All three sizes are in stock including the kydex sheaths. Leather sheaths are special order and need to be hand crafted. Call today….